Anurag Kashyap directs Ranbir Kapoor, Anushka Sharma and Karan Johar in Bombay Velvet, a film noir entailing the nascent days of creation of India’s financial capital. A much anticipated movie given the talent attached and the likes of Thelma Schoonmaker ( Scorsese’s preferred editor) Bombay Velvet has a lot of hype thanks to Kashyap and Johar’s media savvy and a lot hope to revive the floundering career of Ranbir Kapoor, Bollywood’s best actor who has sort of fallen off the wagon. Anushka Sharma plays Rosie Noronah a goa-born jazz singer who comes to Mumbai hoping to make a name for herself as a singer. Ranbir Kapoor plays Johnny Balraj a small-time crook who dreams of dying as a big-shot and moon-lights as a street fighter to sort out his anger issues. 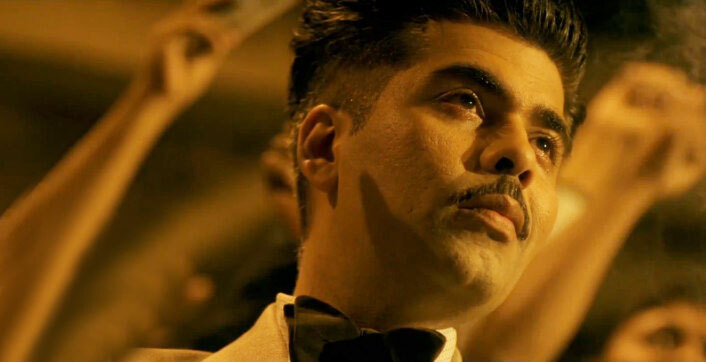 Karan Johar plays Kaizad Khambatta a mobster who wants a piece of the pie in the transformation of the 7 islands to the metropolitan city that Bombay would come to be. With these ambitions driving the lead characters this ought to have been a stylized and cathartic look at the DNA that embodies Mumbai even today. But poor character development and appallingly bad screenplay, movie ends up being more style than substance. 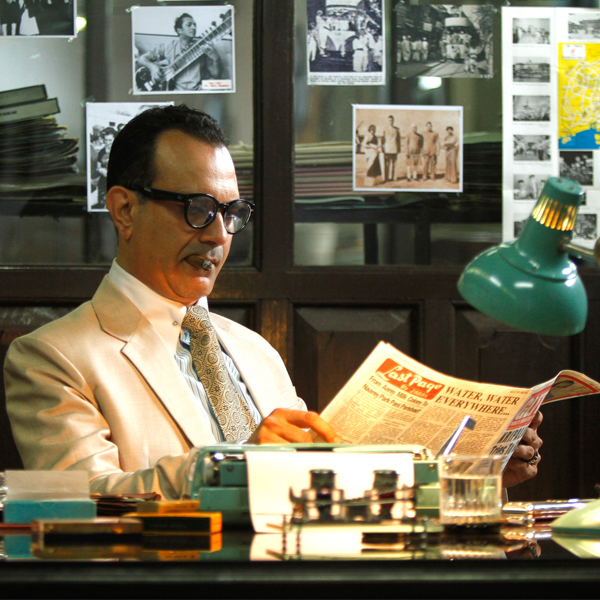 Kashyap seems to have been too busy in the lush production designs aimed at recreating the 60s period look than any attempt at compelling story telling. And even the period recreation seems to rely a little too heavily on the Hollywood version of the 20s and 30s prohibition era inspired movies that romanticised gangsters than a realistic representation of Bombay of the 60s. The movie is supposedly inspired by real-life events fictionalised for dramatic flair. Even the closing credits tell us of Rosie’s fate post the events of the movie and it seems to me that Kashyap, Vasan Bala and Gyan Prakash Thyani relied too heavily on the fading memory of a septuagenarian to ever be in any position to tell a coherent story. Story arcs take off and veer into nothingness. Take for instance Jimmy Mistry the editor of Glitz Newspaper a left-leaning mouthpiece aimed at exposing the corrupt nexus at the base of the Bombay redevelopment plan. He is a major player in the first half of the movie and in the second half – Nothing! Even the actions of its lead pair seem to be hare-brained, they are in love one moment, scheming the next and back in love immediately afterwards. Also Karan Johar who plays a supposedly closeted mobster spouts “tumne usme aisa kya dekha jo mujme nahi hai” out of nowhere and it all just starts feeling like an elaborate joke. The acting is atrocious and the dialogue delivery flat. Ranbir who usually is able to make every character relatable seems to be phoning it in with his crook with a heart of gold act. His character is poorly written and he does nothing spectacular to salvage it. Anushka Sharma continues her transformation into a human babushka doll resembling more and more like Kim Kardashian in appearance and talent. Karan Johar who make his acting debut (DDLJ notwithstanding) and it might join the list of shortest acting career ever. He might be a good director-producer but an actor he is certainly not. Besides the main lead the supporting cast is poorly cast. For a role as significant as Jimmy Mistry’s the casting of Manish Chaudhary is baffling as he brings nothing to the character. Kay Kay Menon is wasted as detective/inspector. Mastermind’s Siddhartha Basu as Bombay Mayor Romil Mehta is the stereotypical corrupt politician and he does nothing to elevate his performance. Vivaan Shah as the chauffer Tony is just a pitiful waste of space that honestly serves no purpose. The only character who seems to have anything invested in this movie is Satyadeep Mishra who plays Johnny’s sidekick Chiman. He has a sense of gravitas and plays the devil’s advocate to Ranbir’s Johnny. Amit Trivedi’s music outside of the movie induces nostalgia to the days of Geeta Bali and other such elusive chanteuses. But the background score often overwhelms the scenery and becomes an overbearing distraction. Niharika Khan’s costume work on Anushka’s stage outfits is staggering and it creates for some stunning shots. But at the same time the costume work overall is pretty inconsistent. Take for instance the police, the commissioner is in khaki, Kay Kay Menon in short sleeve shirts and a hat and sub-inspector in all whites. It is nuances like these that are missing which takes the audience out of the equation and you end up not caring about the going-ons on the screen. Prerna Saigal a first time film editor who collaborated with Thelma Schoonmaker seems to have failed in her duty as an editor as the film’s two and half hour runtime seems far too bloated for its own good. Perhaps it was the poor story and screenplay which did her in but even as an editor there was room to salvage this from becoming an unbearable monstrosity it ended up as. I very nearly walked out at interval because the first half was so life-draining. The first few scenes of the second half gave me hope but then nothing. Characters of no significance were introduced in important scenes and then disposed of just as unintelligently. Also clearly sensing the stagnancy and impotence of the story telling the director introduces a stand-up comic who cracks unfunny chewed up jokes in order to further the story telling in a last ditch effort. alas that effort also falls flat. Overall Bombay velvet seems life a self-indulgent exercise in film making that fails on every account. Inconsistent writing, uninspired direction and insipid acting leave a lot to be desired. It has been a very long time that I was this bored in cinema. Venture at your own peril. P.S. : Last year I saw a preview of Tom Hardy’s Legend that comes out later this year – the version we saw was unfinished with effects yet to be finalised and editing. that was based on a realy life story of the twin gangsters who rules the London of the 60s and that unfinished movie was way more fun than the bore-fest that was Bombay velvet.